Am I a Ghost Magnet? “Am I a Ghost magnet”, don’t laugh, many people do when they heard this statement. Some people very well may be. I have a friend that works here at the library that I always say is “a ghost magnet”. What is a ghost magnet? As far as we are concerned a ghost magnet is some that basically always seems to attract spirits. Are you or do you know someone like this? Because the library seems to have spirits around from time to time, one would expect to have activity. But…..when certain people are around there definitely is an increase of reports. So how does this work? First of all, I am not a professional ghost hunter. I am a librarian that gives ghost tours of our building. With that said, after working here for 20 years, you do learn a few things. During last year’s Beyond Reality Ghosts at the Stanley Hotel event, the renowned psychic Chip Coffee said it best. “If you walked into a room of friendly people and not so friendly people who would you try to talk to?” That made sense to us. Of course you would try to approach the friendlier person. As for the library we have several employees that seem to be just that. I tease Ellie Davis often that we know she is, but Bianca Jorgensen is as well. Ellie in turn reminds me that I am too. It is funny, I don’t always think of myself as such, but I have to admit she must be right. All three of us are tour guides and all three of us seem to have activity. For many years as I worked with my co-workers, several would never seem to have anything happen. Sometimes they would wait and be so disappointed. When something did happen most times one of the “magnets” seemed to be in the building. For me logic would state that truth is in the evidence. Who does the most happen to? One of us. Who makes the most reports? One of us. Who is open or friendly towards the spirits here? Us. There are others to be sure. Many reports are from patrons or the general public as well. Little children occasionally tell stories to their mommies that they have seen a man with a top hat or a lady on the stairs. Little children apparently are more open so they do not “block” and the spirits are able to be seen. It is very hard to explain to someone that does not believe in ghosts/spirits that these things are real. My husband for one is a non-believer. He believes what I report to him and he trusts me, but he has doubts of what others tell him. As I always say seeing/hearing/feeling is believing. If you are like us, remember to keep an open mind. Record what happens to you. I don’t know how it all works exactly, but I know it does happen. For me this has been an unbelievable adventure. I have seen and hear things, been touched and I have seen shadows. And once I saw a lady at the Front Desk of the library that others said was not there. After talking to the couple it dawned on me that many people seem to get our story a bit wrong. I would like to take this opportunity to set the record straight. *We are not built over an old Indian/Native American graveyard. The SWCL is built on the site of the old Green River City cemetery. *If and when reports are made it is not just by the custodial/maintenance staff. Many reports are many by various staff members and the public. *Do things only happen at Halloween or in October? The answer is no. Although that does seem to be a time when there are several things reported we get reports all year round. We have not been able to pin down a “best” time of year or time of day. *Do books fly through the air? I know of one report where one book actually came out of its place on the shelf, hung in the air and dropped. We have a few reports of books falling off shelves and even a whole shelf of books falling. This does not happen often, only rarely. *Do you do séances or use Ouija boards at the library? There has never been a séance in the building to my knowledge. We do not allow Ouija boards at the library. One time a group of high school kids snuck one in and apparently soon after they all got scared and came running out of a back area. We are not sure what exactly happened. *Why do you try to make the ghosts mad? Answer, we don’t. We have a strict “no provoking” rule. Anyone trying to do so or even being disrespectful will be asked to leave. *You guys add to the Ghost Walks don’t you? This usually means are you making these things happen. The answer is not to our knowledge. Paranormal things have happened in the building since before most of the staff started working here. We do not play tricks on the public or enhance the evidence in any way. We do enlarge photos or lighten or darken them, but we never Photoshop or add to the images. You get what you get. If there is evidence we share it, if there is not we tell you that also. *Is the staff the only ones to have things happen? We aren’t. A good share of the reports, are turned in by patrons and the public in general. * Can I bring my two year old? No. This is not a funhouse/spook alley. It is not a Halloween gag. It is the real deal. 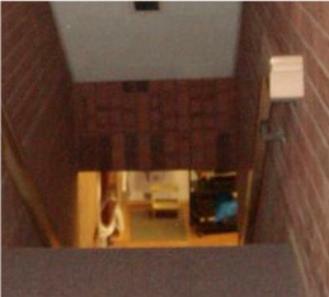 The building is built on the site of the old cemetery and there does seem to be “spirits/ghosts” around. We have no control on what they do or when they do them. We have had younger children attend some time ago, but due to a few probelms we had to raise the age limit to 15. Small children cry when they get tired and some younger children want to act out and it disrupts the hunt. Overall, here is a basic rundown of how things work at the library. We do not add to the Ghost Walks or what happens at the library. It is not a spook alley/Halloween trick. We take our Ghost Walks and reports seriously. Those of us that do the Ghost Walks try to debunk as much as possible and we try to keep informed on technology whenever we can. By educating ourselves we can better serve the public. A few of the staff have attended ghost hunting seminars just to learn the ins and outs, the do’s and don’ts. It is for the public, our patrons we do this. Please join us in one of our upcoming Ghost Walks to see for yourself if the Sweetwater County Library is in fact haunted. Next Ghost Walk tickets go on sale May1st 9am for the May 18th Ghost Walk. For more information call 307-875-3615. Hope to see you there.